Russia's rekindling of an aggressive moon exploration plan was unveiled by Igor Mitrofanov of the Institute for Space Research (IKI) in Moscow during Microsymposium 54 on "Lunar Farside and Poles — New Destinations for Exploration," held in The Woodlands, Texas, on March 16 and 17. Russia’s new moon exploration agenda involves orbiters, landers, rovers, and return sample spacecraft. At the microsymposium, Mitrofanov discussed Russia's moon mission schedule over the next several years. "Depending on the success of these [first] three missions, another two will be implemented," he said. 2015 — Luna 25 (Luna Glob Lander):A small lander on the moon's south pole that would analyze lunar regolith and local exosphere and test volatiles from less than 2 feet (50 centimeters) subsurface. 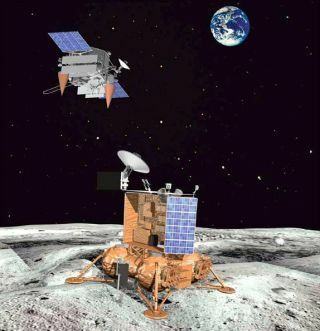 This spacecraft would showcase lunar landing system technology, communication systems and longtime operations. 2019 — Luna 28 (Luna-Resource-2): A "to be determined (TBD)" mission f that is a polar moon sample return involving cryogenic delivery of lunar samples back to Earth. This mission would help develop return flight system technology for transiting between the moon and Earth.